It was a good bracing talk. 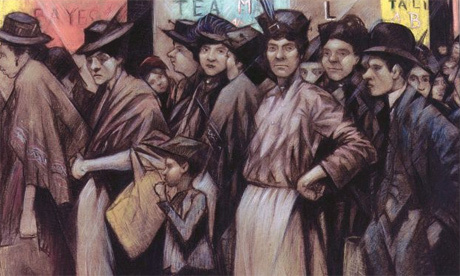 She doesn’t rate Nevinson highly, though she reminds us that during the War he was often seen as the pre-eminent war painter, with a greater reputation than, for example Nash. She sees his talent as mostly one for gaining publicity (and can’t you just think of some a couple of today’s artists of whom that is equally true?) and poured especial scorn on the truly dreadful ‘problem pictures’ he produced in the 1930s, like this one, The Unending Cult of Human Sacrifice (1934). It’s a horrible hectoring picture, seemingly intent on seeing how many clichés can be collected in one aesthetically dead image. In the other room at the Leicester Galleries are paintings by Mr. C. R. W. Nevinson, an artist of a very different kind from Mr. Gertler. If the latter is disagreeable but serious, the former is facile and frivolous. A wonderful gift for picking up some passing trick and exploiting it without any understanding of its proper application makes of this exhibition an anthology of all the unimportant achievements of English painting for the last twenty years. Some mild imitations of a technique evolved by the hangers-on of Cubism, such as Souvenir de Bretagne (73) ; some insensitive landscapes (41 and 58) in a style in which sensitiveness is the essential for success ; some crudely symbolical paintings in an effetely Catholic manner ; a thin fantasy, Castles in Spain (72)-these are some of the dishes offered to us by Mr. Nevinson. About the thirties work at least the horrible old Communist is dead right. But I can’t help arguing. ‘ A wonderful gift for picking up some passing trick’ is a fair description of Nevinson’s first war pictures, which use the tricks of Futurism to convey war’s excitement (and, I would say, to ask the viewer to collude with war’s violence). But then he began to paint differently, turning his back on Futurist trickery, to produce images like A Taube or The Food Queue. These have none of the exciting momentum of futurism, but produce an effect of heavy stasis, a war that must be endured, and will keep producing on misery. Sue Malvern made the point that he was very conscious of the publicity value of these paintings, and exploited any hint of censorship. There was the stunt, for example, of covering up the path to Glory with a ‘Censored’ sticker’. But for me at least they remain some of the most striking and true pictures of the War. I agree that he was a bit of a poser before the War, and a windbag afterwards, but I’d say that these pictures are the real thing. Go back to the top of this article and look at that group of rather thuggish, utterly believable soldiers. Well, he’s not the only artist or writer to have found his subject during the war, and then to have been at a loss afterwards about what to do with his talent. This entry was written by George Simmers and posted on January 21, 2015 at 10:11 am and filed under War Artists. Bookmark the permalink. Follow any comments here with the RSS feed for this post. Post a comment or leave a trackback: Trackback URL. Nevinson certainly exaggerated his own war service after the war, but he was hardly alone in that. But I am not sure how much of a “stunt” it really was, sticking the word “censored” on a painting that the War Office had refused to approve for official exhibition. Nor do I know if Wikipedia can be trusted in the statement that “The censor (also) objected to A Group of Soldiers (your ‘utterly believable’ soldiers) on the grounds that “the type of man represented is not worthy of the British Army”” or if Nevinson was indeed reprimanded for using the word “censored” in public without permission. If so, he can hardly be blamed for drawing attention to official idiocy (and likely using it for his own purposes). Presumably, the government preferred the earlier futurist “trickery” and glorification of violence. And the picture of the French machine gunners does remain impressive. 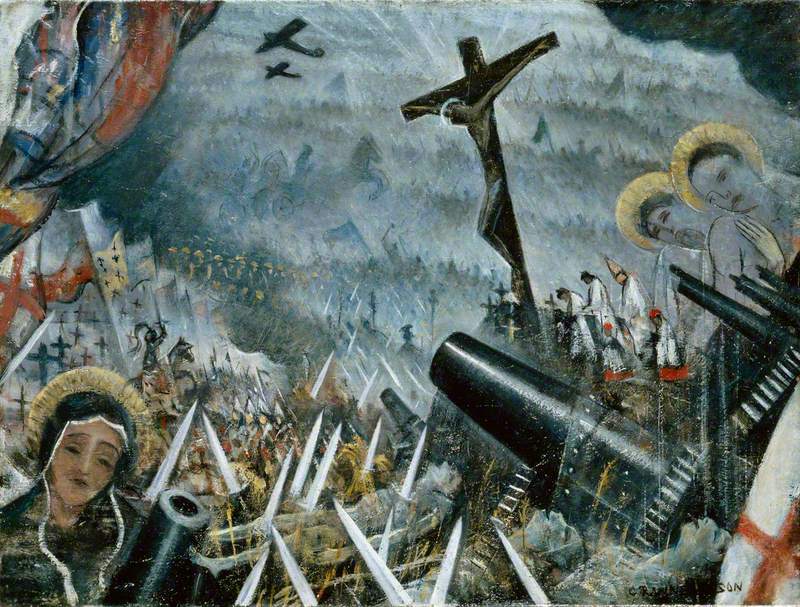 Yet Nevinson’s troops are actually more soldierly than, say, Kennington’s Kensingtons in the glass painting. William Orpen also had trouble with Lee, but used less frontal tactics to combat him. He was on good terms with Haig, and when Lee wanted to have him barred from France, Orpen apparently sat in Lee’s headquarters, waiting for a pre-arranged telephone invitation to dine with Haig in order to fix up a date for Orpen’s official return to France. Lee accepted that Orpen had out-manoeuvred him, and later the two became friends. There seems a tinge of irony to the “friendship”. But Lee never really liked being a censor, and would have much preferred to be a “proper” soldier. It has a truly nightmarish quality; even the shades of red, white, and blue are fittingly ghastly. The faces of the saints and the virgin Mary are blank, inhuman masks, and Jesus is an attenuated shadow-figure, a victim of the “Cult” he is too insubstantial to hinder. He is propped up not to save but to rally to arms. The images of battle and carnage, packed impossibly together, repeat not just into the distance but eternally up to – and beyond – the upper border. Depending on one’s taste in art, of course. I’d call it a very bad painting because it’s using stock symbols to create an emotive effect, without any grounding in actuality. The utter contrast between the brutal weapons of war and the – as you say – insubstantial figures of good seems to reflect a mere panic in the face of technology. The painting reflects no thinking about how humans should react to the threat of war, apart from fear – so I don’t think we can call it prescient. In his early futurist-style paintings, Nevinson had celebrated violence; but at least the designs were clear and effective. In his best war paintings, he looks objectively at the results of violence, and tells us something about actual life. That group of soldiers – too thuggish for official taste – show the resilience, and maybe the thuggishness necessary to win the war. The symbolic problem pictures of the thirties were good at getting press coverage in the popular papers, but their messy and crowded composition conveys nothing clearly, and surely confuses rather than illuminates the political situation. Are the guns and bayonets in ‘The Unending Cult’ symbols of fascism and the threat of Hitler? If so, Why are Christian icons shown as the victims, when in Spain and elsewhere the Church was on the side of the fascists (as indeed Nevinson sometimes seems to have been)? Awesome blog, thanks for posting George! There are three kinds of persons depicted: the dead; the ineffectual, hypocritical, or fraudulent religious figures; and the crashing tide of seemingly enthusiastic participants. If the images are individually cliches, their presence jam-packed together in a surreal context beyond space and time is not. Whether it was “too easy” to paint doesn’t enter into my judgment. But as I suggested, one’s true reaction to a painting is largely a function of taste. I appreciate Picasso as a theorist, but I must say his work leaves me cold. 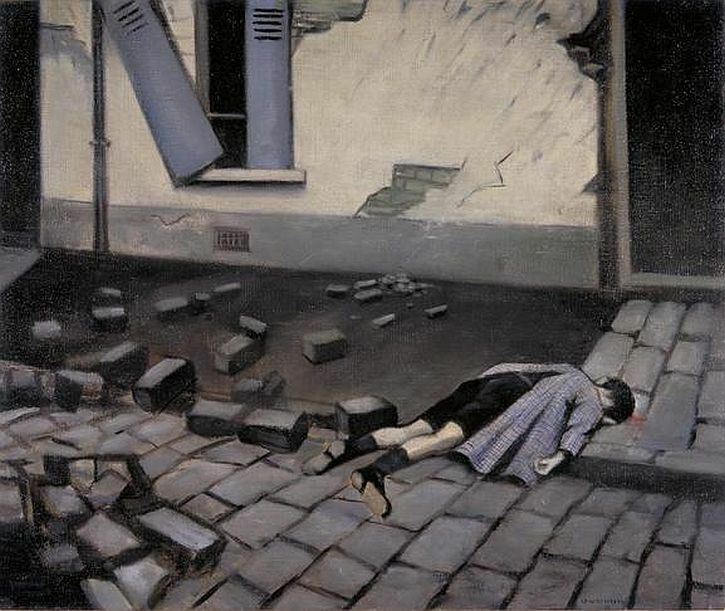 Nevinson’s painting, whatever its unfashionable “flaws,” does not. Not being able to get over to Birmingham by today, I have to rely on memory re “The Unending Cult” but I am fairly sure it was technically quite poorly painted, as compared to other Nevinson work. I have also glanced through “Paint and Prejudice” (luckily enough available online) to see if that gave any clues about the state of his thinking at the time he painted it. I had forgotten quite how bizarre Nevinson could be, in between his paranoia and eccentric name-dropping (eg “I met A.E. Housman and to watch the poet dressing a crab was a revelation”) but it did remind me that at about the same time as he painted “The Unending Cult” he was also collaborating with Princess Troubetzskoy on ‘Exodus : A Warning to Civilians’ a “sensational” novel apparently about “the collapse of civilisation and the terrifying insane panic which follows the destruction of London from air attack”. Perhaps it is part of the same nightmare. Levinson points out that he was the first artist to paint whilst airborne (likely true, I suspect) and aerial warfare seems to recur in his work. In the Postmodern world of free-for-all criticism, though, I’m not sure if the phrase “quite poorly painted” retains very much meaning. Actually, technical analysis has survived better than the concept of “taste”, but you are right that “poorly” would be better replaced by a word like “clumsily”. I note I misnamed Nevinson as Levinson at one point in my last comment – “descendent of lightning”. Hmmm. Apparently described by Nevinson as “A Cartoon for a Mural Decoration of a Public Building or Seat of Learning, suggested by the Clash between Thought, Mechanical Invention, Race Idolatry, and the Regimentation of Youth”. I assume a degree of irony, but you can never quite tell with him. I wish I could believe he was ironical, but he took himself rather seriously, I gather. These ‘Problem Pictures’ of his sold fairly well at the time, but apparently a lot of them have simply disappeared over the past eighty-odd years, as they have gone utterly out of fashion. 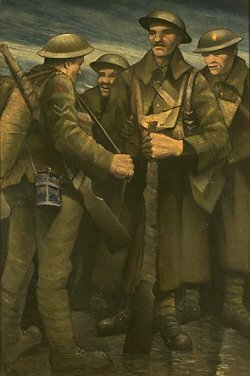 Many of Nevinson’s titles for his paintings are ironic – “Glittering Prizes” and “Paths of Glory” most evidently – although I agree that he rarely displays any irony directed towards himself. All the “problem pictures” seem to have pompous titles (or sub-titles). Although he was always unashamedly commercial, I doubt he produced them (or any particular subject) simply to make more money. I’m sure, even then, there was much more profit in churning out war scenes, portraits and landscapes. After he gave up the “problem” pictures, he seems to have spent a couple of years painting flowers. In fact, I believe he never sold “Twentieth Century”, but gave it to a Newcastle gallery a couple of years before he died.